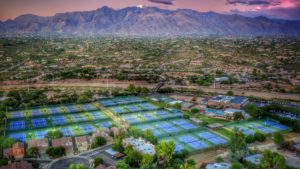 The Tucson Racquet and Fitness Club, over the past forty years, has offered the finest in quality tennis instruction, clinics, leagues, and camps in a relaxed family setting. The Tucson Racquet and Fitness Club professional staff has set the highest standards by which all other programs in the Southwest are measured. Our instructional programs are presented with a personal touch, making learning both easy and enjoyable. Outstanding instructor to student ratios assure an atmosphere of fun and achievement. Leagues and other fun activities are offered to include all our members in the Racquet Club tennis community. 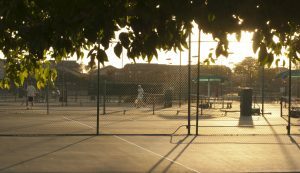 The Tucson Racquet & Fitness Club offers the finest and most complete tennis and health facility in Tucson. Included on our 20 acres by the river are: 30 tennis courts, 12 pickleball courts, 11 racquetball courts, aerobics/ exercise classes, two 75’ junior Olympic heated pools, basketball & volleyball courts, fully equipped weight room, cardiovascular machines, 2 Jacuzzis, steam room and sauna, full service beauty, massage, and skin care salon. Excellent child care is available to members and their guests. Looking to improve your tennis game? The Tucson Racquet & Fitness Club offers private lessons for those wanting individual attention specific to their goals and aspirations. Private clinics are also available. Bring in your friends or your team and get a workout custom designed to your needs. Check out our amazing Tennis Staff HERE. The program cost for members is $50 per hour for nonmembers $60 per hour.